Integrating with Drupal is can be extremely complicated due to our ability to customize Drupal. We highly recommend that you contact your Customer Success Manager (CSM) to set up a meeting with a Kapost team member to set up the integration for you. If you would like an overview of how the integration works, you can take a look at this article. I have already worked with a Kapost developer to make my Drupal blog Kapost-ready. What next? You can go to the Kapost App Center and add your Drupal blog, but we would still highly recommend that you work with a Kapost team member. The most important thing to know is that each of your Drupal nodes (or blog types, or content types, as you might call them) need to be created as a separate connection in Kapost. For example, if your Drupal blog has two content types/nodes called Articles and Stories, each will have its own connection in the Kapost app center. For a step-by-step guide on how to add Drupal to your App Center, read this article. Why isn't my featured image being published correctly? Make sure you have the Kapost Byline Plugin downloaded and installed for this feature to work. Download it here. Make sure that the image allotment size in Drupal is set to as high as possible so that Kapost images can get through. If you already have your plugin installed and your image allotment is set, submitting a support ticket and we can troubleshoot the issue. What if none of my author's names or bios are carrying through to Drupal from Kapost? Make sure the author's email listed in Kapost matches the email listed in Drupal. This is the field that Kapost and Drupal look at to determine which Kapost user to list on an asset. What if I want to publish the asset with a different author than what is listed in Kapost? If the author in Drupal is not a user in Kapost you will need to create a custom field to note the Drupal Author email to be on the asset when you publish. Learn how to do so here. Ensure that you have some sort of tracking method set up. Do this by integrating with Google Analytics or by clicking the Performance Tracking box under Settings -> General. If you check the Performance Tracking box and Google Analytics is not installed, this tells Kapost to add a small strip of code to each asset you publish. It will not appear on your blog, but it is what allows us to collect analytics on your asset. It is called the Kapost Analytics Code. More information can be found here. It is individual to each asset and cannot be added manually. What happens if I want to remove an asset from Kapost that I posted to Drupal? Go into Kapost and re-publish the asset as a draft. This will make it hidden in Drupal. 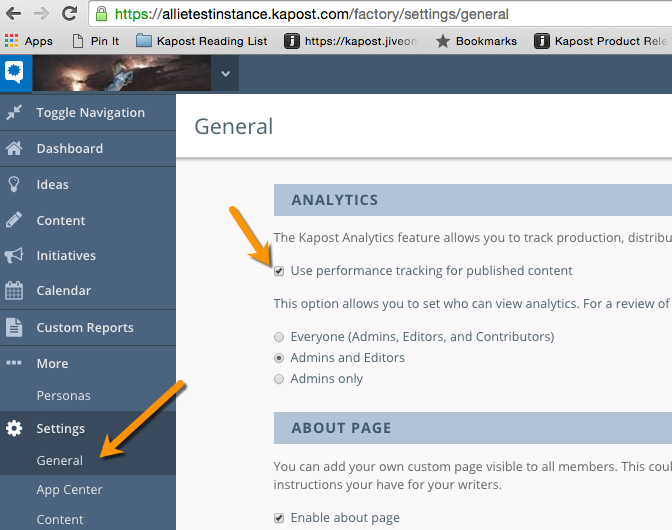 To do this, click the publish button on the Kapost asset and select the draft option from the pop-out window. Do not remove the asset from Drupal and then republish from Kapost. This will cause an error. If you have already done this, please submit a support ticket so we can troubleshoot the issue. You can remove the asset from Drupal as long as you do not republish from Kapost later. If you need to republish the asset, remove that asset in Kapost and create a new one then publish. Why am I getting an error when I try to connect my Drupal site to the Kapost app center? Before you do anything else, make 100% sure that the username and password you're using are up to date by trying your credentials on Drupal itself. If everything is up to date, the issue may be that you are using a long form of your blog's URL. Kapost just requires the simplest form of the URL. For instance, if I wanted to connect my pet blog to Kapost, I would just enter "http://dogsandcats.com" as the URL, even if "http://drupal.dogsandcats.com/careblog" was where all posts would eventually end up. If you are still having trouble, submit a support ticket and an engineer will help you troubleshoot the issue.